TOGETHER, WE PROSPER. Looking for local business connections? We are here to help. HYDROGEN WATER Enagic’s Kangen Water® systems enhance nature’s most vital life-source using the latest scientiﬁc research and technology, merged with superior Japanese craftsmanship. You only need to peruse our member directory or join us for one of our monthly meetings to marvel at the diversity of the Uxbridge Networking Group. Our membership includes small, home-based businesses, large franchise owners, enterprising start-ups and long-haul entrepreneurs. This strong multiplicity of talents continues to enjoy the successes of collaboration — and other people have got the message, too. In the last six months alone, our membership has increased almost 30% and we’re driving for more growth in 2019. We know we can achieve more together. In this issue, we celebrate the accomplishments of our members. From the expansion of NRG 4 Life from a basement studio to a 6,000 square foot fitness centre, to collective initiatives of UNG members like the Young Canadian Space Club, to member bestowed and received awards, the UNG is proof that we work better when we work together. Working together is the impetus behind one of our newest, most exciting projects: the UNG HQ. Available to members for discounted rates, these workspaces will provide business owners and entrepreneurs another place they can do business, whether it’s a presentation, a workshop, a webinar or just a convenient, quiet workspace. It’s only Spring, but 2019 is already shaping up to be an exciting year for the UNG. If you’ve been wondering about joining us, this is the year to make the leap. UNG MEETING SCHEDULE All meetings are held at the Foxbridge Golf Club located at 350 Reach Street, Uxbridge. Breakfast Meetings 8:15 a.m. to 9:30 a.m. Lunch Meetings 12 noon to 1:30 p.m.
BOOK A COMPLIMENTARY WATER TESTING & DEMO TODAY! Year Round Collaborative Opportunities Monthly Meeting & E-Newsletter Business & Professional Development Initiatives Promotion Across Website, Magazine, Social Media & Community Events • Members discount for meeting room, workshop space rental at the new UNG HQ located at 92 Brock St. W. in downtown Uxbridge. Member Spotlight: NRG 4 Life Contact Annie Hardock at 416-529-6686 to RSVP for meetings or UNG HQ rental inquiries. E-mail: unghq@uxbridge.com. Contact Jennifer Culley at 416-708-2306 or email ungmembership@uxbridge.com for UNG Membership inquiries. This year, we are open for selective Elite Corporate Sponsors to join this dynamic group in the heart of our business community. Bigger Space for a Healthier Community! NRG 4 Life has come a long way since owners Sarah and Terry first began hosting weekly 6am bootcamp classes at Elgin Park, but the motivation behind their business remains the same: to bring the “fun” into fitness and take away the weighty intimidation of joining a gym. Thanks to the enthusiastic response to that first morning class (which still runs every month), Sarah and Terry quickly expanded their offerings. First, they held classes at community spaces around town. Then, a few years later, they built a home studio for classes, as well as personal training services. Passion, professionalism and a commitment to helping their clients achieve real-life, long-lasting goals drove their success, and by 2011, NRG 4 Life moved into to a location in downtown Uxbridge, then three years later, to an even bigger, 6,000 square foot facility on Main Street. Featuring high ceilings, a mezzanine, bright, open and spotlessly clean space as well as plenty of room for classes, personal training and individual training, members and staff are delighted with NRG4 Life’s newest, permanent location. Today, Sarah and Terry’s team includes 30 staff members and a hoard of eager fitness enthusiasts of all ages and all fitness levels. The new facility is certainly an attraction, but what keeps members coming back is NRG’s ability to make anyone feel welcome and comfortable. More than that, to make anyone feel capable of living their best life in a healthier body. Sarah, Terry and their team aim to liberate people from the false notion that gyms are only for buff bodies. Rather, they strive to promote the ubiquitous possibility of health and fitness for everyone, regardless of size, age or ability. To find out more about NRG 4 Life and their services, visit http://nrg4lifefitness.net. We look forward to meeting you at one of our events, or simply reach out to me for further conversation. North Durham’s go-to station for news, trafﬁc & local events. One stop shop for advertising on over 90 stations across Canada. Better, Together: Collaborative Efforts by UNG Members Since its inception over 20 years ago, the Uxbridge Networking Group has been a driving force in championing both entrepreneurial independence and collaboration. Offering members opportunities gain more lifestyle and financial freedom by growing their businesses, the UNG has also advocated the importance of working together to help achieve this end. Over the years, we’ve nurtured several successful collaborative ventures to life. Today, we’re happy (though not surprised) to see them thrive. Check out our most enduring collaborative efforts, as well as some exciting new ones! together to put on a outstanding show. 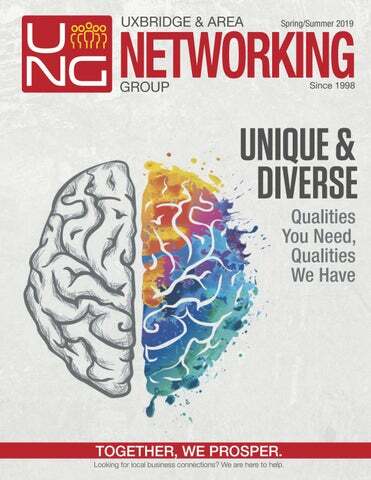 The UNG Networking Magazine The UNG Networking Magazine is our longest running collaborative project. When Chris Auger of Dire Marketing and his son, John Auger, launched their business in Uxbridge in 2010 and joined the UNG as members, they approached UNG Founder Annie Hardock about creating a magazine for the networking group. The idea took off. Now, almost 10 years later, the UNG magazine is delivered bi-annually to businesses around Uxbridge and beyond. With up to 2,500 printed copies per issue for free pick up, this publication has helped bolster the UNG’s recognizability and led to thousands of leads for our membership. As you’d expect, its persistent success is a team effort. Thanks to John’s talent in graphic design and the vision of his company seven8creative, the UNG’s at-once recognizable logo and cover design has enticed countless readers to peruse the pages and learn about local and regional businesses and opportunities. With branding and strategic direction from Annie, Hollay Ghadery — a professional writer from River Street Writing — creates the articles for each issue. Chris’ exceptional project management keeps the team on-schedule and the magazines in-print, on time. As evident by the modern phenomenon of the digital age, all this is done without the group meeting in person, as the team lives a distance away from one another, with offices in Uxbridge, Sunderland, Keswick and Barrie. The magazine focuses on business achievements, expert advice from members, and includes a membership directory that helps readers find business connections, products or services within the community. In step with the UNG itself, the UNG Networking Magazine has enjoyed incredible growth in the last few years, with plans for further expansion both in print and online. Come join the UNG on May 4, 2019 from 10am to 5pm for the Durham Lifestyles Show. Created by UNG members to nurture strong communities and strong economy, this interactive event encourages local shopping by introducing residents to an impressive range of businesses, while also introducing businesses to each other. Held at Mill Run Golf Club in Uxbridge, the Durham Lifestyles Show is an exceptional opportunity to increase awareness about your business while learning more about how to make your business stronger. Come for the guest speakers and free admission. Stay for the incredible prizes donated by vendors, including free pizza for a year by Boston Pizza, a consultation worth $500 from AL Designs and a framed photography piece from Lorelei Interiors. When opportunity knocks, answer! Vendor spaces are still available. Visit www.durham-lifestyles.com for more information. Member Spotlight: Swapneet Ranike (Uxbridge & Whitby North Boston Pizza) Living the Canadian Dream Swapneet’s journey started in 2017 when she moved to Canada from India with her husband and two young daughters. She was happy, if not a bit afraid, too. Leaving one’s home, culture and language is no small sacrifice, but she believed in her desire to come to Canada; a place she felt held boundless opportunities. Swapneet had completed her PhD in Human Resource Management before immigrating, and once here, she pursued an upgraded course in HR. As she’d hoped, opportunities poured in. Among them, the opportunity to become an entrepreneur and own a Boston Pizza. She jumped at the chance. Since its launch in the February 2019, the Young Canadian Space Club has inspired our region’s future astronauts and space lovers with nebulasized delight. Offering a fun and educational opportunity for youth to learn about space through interactive activities, this group is the brainchild of UNG member Stan Taylor — also known as Stan the Science Man. As a believer in giving back, Swapneet’s Uxbridge Boston Pizza is an enthusiastic supporter of the community, sponsoring Uxbridge Cottage Hospital, Cam Kids, golf tournaments, Precious Minds, Young Canadian Space Club, Ladies Night at Canadian Tire, the Legion, the new Animal Shelter for Uxbridge-Scugog, and many junior teams in the town. time and energy to seeing this enterprising program for youth take off. Stop by and see the new Boston Pizza! Strengthening our community starts with supporting each other. Being away from home, Swapneet knew she needed to live in a close-knit community. She heard about Uxbridge — a small town at heart despite its growth — and she was confident it would be the perfect place for her and her family. She was right. “I can’t be more thankful for all the love and affection I’ve received since coming here,” Swapneet says. Among the recent improvements to Uxbridge Boston Pizza is a special community wall dedicated to the town. They also raise money for good causes by hosting celebrity server events, where 10% of sales are donated to a charity of choice. UNG Membership Listing 105.5 HITS FM www.1055hitsfm.com 6050 Owen Road, Unit #2, Uxbridge Jennifer Culley, Account Executive T: 905-852-9992 E: jculley@1055hitsfm.com North Durham’s local radio station, playing today’s best music, local news, traffic, sports, weather & community events. 2BEEZ PROMOTIONS www.2beezpromotions.com Carmine Benincasa T: 289-460-2978 E: carmine@2beezpromotions.com We provide printing, apparel, graphic design, photography, signs, ad specialties, websites and direct marketing services. A L DESIGNS aldesigns.co Arlene Lyon (Owner), Principal Interior Designer T: 905-904-1488 E: Arlene.lyon@hotmail.com Interior design service with drawings/3D illustrations for individual room, new build construction. A TREASURED GIFT www.atreasuredgift.ca Gayle Summerland	T: 416-209-8538 E: atreasuredgift@outlook.com When a smile is all the thanks you need. Gifts for all occasions. ABS ABACUS BRAIN STUDY www.abacusuxbridge.com 92 Brock Street West, Uxbridge Annie Hardock, B. Math T: 905-852-6677 E: abacus@uxbridge.com A unique method of mental math training that exercises the whole brain. Promote 19 brain powers with high-speed listening training. ASSISTAP www.assistap.com 123 Meadowlands Drive, Cannington T: 647-938-5134 E: assistap@yahoo.com Provides senior level virtual administration, which allows the customer to direct their focus on what they do best. BOSTON PIZZA UXBRIDGE FB: @BPUxgridge 284 Toronto Street South, Uxbridge Swapneet, Ranike, Owner T: 905-852-0003 E: ranikes@bostonpizza.com We offer casual dining with more than 100 menu item including gourmet pizzas made with our signature hand pressed dough. All Listings with a red dot indicate that an ad was also placed in the magazine. BDO CANADA LLP www.bdo.ca 1 Brock Street East, Suite 1, Uxbridge Randy J. Hickey, CPA CA Client Services Partner T: 905-852-9714 E: uxbridge@bdo.ca BURRWOOD PHYSIOTHERAPY www.burrwoodphysio.ca 106 Main Street North, Uxbridge Esther Wood, Registered Physiotherapist T: 647-494-4800 E: burrwoodphysio@gmail.com Improve your move!! Offering physiotherapy services including: manual (hands on) therapy, acupuncture/IMS, custom exercises, electrotherapeutic modalities, therapeutic taping. CANADIAN SCHOOL OF NATURAL NUTRITION, DISTANCE EDUCATION www.csnndistanceeducation.org P.O. Box 896, Uxbridge, ON L9P 1N2 Anna Mae Adams/Lisa Adams T: 1-800-328-0743 Teaching the Medicine of the Future.™ CSNN offers a comprehensive practical foundation program in Natural Nutrition leading to the Registered Holistic Nutritionist (R.H.N. )™ designation. DARLENE CORDINGLEY BOOKKEEPING 685 Ravenshoe Rd, Uxbridge Darlene Cordingley T: 416-684-0053 E: dcordi2015@outlook.com Bookkeeping and Budget Specialist. Business support & guidance. Quicbooks Pro, Quickbooks Online, Sage 50 Pro. DURHAM COLLEGE EMPLOYMENT SERVICES www.employmenthelp.ca 29 Toronto Street South, Uxbridge T: 905-852-7848 E: uxbridge@employmenthelp.ca Provides job seekers and employers a variety of free services: Employment Support, Job Development & Training/ Community Planning. Elite Marketing & Concierge Services www.EliteMarketingandConcierge.com 2721 Bur Oak Ave., Markham ON Jennifer Gowland, Owner T: 905-554-0211 E: info.elitemc@gmail.com A one-stop-shop for entrepreneurs to market and grow their businesses. COMPRESSIONS 4 YOU www.compressions4you.ca 40 York Street, Udora Raquel Bruinsma, Owner T: 705-228-8282 E: rbruinsma@compressions4you.ca A Canadian Red Cross training partner, providing First Aid training for workplace requirements or for general interest. ERIC KIS ACCOUNTING SERVICES Eric Kis T: 905-852-9110 C: 416-712-7816 E: eric@erickis.com Accounting services. Bookkeeping to corporate tax returns and everything in between. Certified Quickbooks Pro Advisor. CURVES UXBRIDGE www.curves.com 97 Brock St. West, Uxbridge Carrie-Lyn Dufton, Owner/Operator T: 905-852-2878 E: curvesuxbridge@powergate.ca 30 minute circuit workout that works every major muscle group with strength training, cardio, stretching, and also a coach to help with proper form, answer questions and offer encouragement. FAMILY HISTORY SIMPLIFIED www.familyhistorysimplified.com 79 Tunbridge Road, Barrie Louise Todd, Owner T: 705-241-9850 E: louise@familyhistorysimplified.com Your past is waiting. Knowing your family history can make a difference in your life! Let’s start your journey. CUSTOM WORLD VACATIONS www.cwvacations.ca Robert Smith, President T: 647-560-1784 E: bsmith@vacations.ca Full range of travel services through our affiliation with Expedia Cruiseship Centers. Enjoy savings with our groups and rewards programs. DIRE MARKETING www.direnow.com Chris Auger, Owner T: 905-806-1954 E: chris@direnow.com We do graphic design, we can print for you and source products and services. FOXBRIDGE GOLF CLUB www.foxbridgegolf.ca 350 Reach Street, Uxbridge Clubhouse: 905-852-7962 Scrambles: 905-852-7323 Play great greens at affordable prices. FRASER EDUCATION www.fraser-education.com 7 Adams Court, Uxbridge Dr. Anne Fraser, PhD – President T: 905-852-1145 E: rafraser@powergate.ca I provide private tutoring in my home to help elementary, high school, college and university students achieve success. I also work within the business community. HEATHER ASHTON Independent Financial Representative T: 416-803-7955 Helping families earn more income and become properly protected, debt free and financially independent. HR ASK ME www.hraskme.com 18 Button Crescent, Uxbridge Martin Birt, Owner T: 416-556-8033 E: hraskme.mgb@gmail.com HR consulting with focus on harassment investigation, policy reviews & updates, support to divestments, closures, M&A. IDLEWILD SOAP COMPANY www.idlewildsoapcompany.com 20 Smith Drive, Sandford Lisa Adams, Owner T: 416-797-6587 E: idlewildsoapco@gmail.com Handmade soap and body products. JAMES~CAMPBELL INSURANCE BROKERS www.jamescampbellinsurance.com Larry James, CAIB, President T: 905-852-9191 TF: 1-888-354-6444 E: info@jamescampbellinsurance.com We’ll shop your insurance for the best possible rates guaranteed! All lines of insurance: Commercial, Residential, Auto, Recreation, Farm, Life & Health. Karen Porter - Holistic Health & Return To Food Coach www.karenporter.ca T.: 416-414-5356 E.: karen@karenporter.ca I help busy entrepreneurs to heal their gut, so they can improve their gut instinct, increase energy and focus to accelerate their business. KATHY NORMANDEAU, OGPT Piano Technician www.uxbridge.com/arts T: 416-518-8897 E: uxbridgeintune@gmail.com Helping Uxbridge stay in tune: piano tuning, repair, consultation, instrumental service. Registered Craftsman Technician with the Ontario Guild of Piano Technicians. K.R. MAY REAL ESTATE LIMITED, BROKERAGE mayrealestate.com Nancy Hill, Sales Representative T: 905-642-2223 C: 416-735-7041 E: nahill@trebnet.com A life-long Uxbridge resident, award-winning Law Clerk and licensed sales representative since 1995. LEGAL SHIELD www.shawl49.legalshieldassociate.com 7 Beckett Avenue, Holland Landing Jonathan & Linda Shaw, Independent Associates T: 905-717-3274/3278 E: jshawc512@rogers.com E: lindashaw973@gmail.com Affordable, high quality, legal access for families and businesses. Identity theft protection and restoration service by Global Risk Consulting Experts. LISA RITCHIE, CPA, Accounting Services www.lisaritchie.ca 304 Toronto Street S, Suite 207, Uxbridge T: 905-862-4166 E: lisa@lisaritchie.ca Professional accounting, bookkeeping and tax preparation services. Committed to developing a strong relationship and excellent communication with every client. LIVE LIPHE www.liveliphe.com 621 Sweetwater Crescent, Newmarket Sylwia Swider, Hydration Specialist T: 416-453-1058 E: liveliphe1@gmail.com Machine converts tap water into “functional water” producing five types of water. Anti-oxidant drinking water and replaces chemical cleaners saving money. LORELEI INTERIORS www.loreleiinteriors.com 97 Brock Street West, Suite 2D, Uxbridge Pam Domingos, Owner T: 905-862-3939 E: pam@loreleiinteriors.com Custom drapery. Canadian manufactured blinds, shades and shutters. MAIN STREET REALTY LTD. BROKERAGE www.getusold.ca 11 Main Street, Uxbridge Wayne Cordingley, Broker, ABR, SRES T: 416-936-0254 E: wrcord@gmail.com Real Estate Broker, ABR, SRES. (ABR) Accredited Buyers representative. (SRES) Senior Real Estate Specialist. MAPLEBROOK DENTAL www.maplebrookdental.ca 280 Main Street North, Unit 300, Uxbridge T: 905-852-2672 E: info@maplebrookdental.ca Family and General Dentistry in Uxbridge. We can help ensure the best oral health for all members of your family. MARY’S COUNTRY KITCHEN Mary Evans T: 905-852-5578/905-260-4572 E: robmaryevans@hotmail.com Offering freshly made delicious meals and desserts for any occasion. Anything from a business lunch to a full wedding, we will create a menu to suit your needs. MARY KAY INDEPENDENT BEAUTY CONSULTANT www.marykay.ca/mlazaroiu 550 Davis Drive, Uxbridge Mirela Lazaroiu T: 647-990-3616 E: mir_laz@yahoo.ca Enriching women’s lives through the latest technology and leading-edge products in skin care, body care and makeup. MILESTONES AND TRANSITIONS www.milestonesandtransitions.com HO: 60 St. Clair Ave. W., Suite 301, Toronto Partners – Patricia Fenton, MSW RSW Michaele-Sue Goldblatt, MSW RSW, Betty Ann Streeter, MSW RSW, T: 416-486-1056 E: info@mandt.ca Social work services for individuals and families facing significant changes, planned or unplanned, parenting, marriage, retirement, loss, comprehensive seniors’ services and more. MILL RUN GOLF CLUB www.golfmillrun.com RR#1, 269 Durham Rd. 8, Uxbridge Ryan Tracy, General Manager T: 905-852-6212/1-800-465-T-OFF A full-service facility with 45 holes of golf, first-class banquet facilities for up to 400 guests and a value proposition that is second-to-none. MORTGAGE INTELLIGENCE www.uxbridgemortgagesolutions.ca 141 Reach Street, Suite 2c, Uxbridge T: 905-852-5885 E: kari.geddes@ uxbridgemortagegesolutions.ca Professional, independent mortgage advice as a Mortgage Agent. NOURISHING ENERGY www.nourishingenergy.ca 304 Toronto St. S., Suite 212A, Uxbridge T: 647-688-6268 Nourishing Energy focuses on blending the Eastern with Western philosophies. The practice combines nutrition, energy reading and healing with Feng Shui. NRG 4 LIFE FITNESS www.nrg4lifefitness.net 284 Main Street North, Unit #100, Uxbridge T: 905-852-4750 E: sarah@nrg4lifefitness.net Fitness facility, nutrition coaching, personal training, fitness classes & bootcamp programs. “Strengthening Uxbridge one person at a Time!” OPTOMETRIST, DR. VI TU BANH www.uxbridge.com/healthandwellness 2 Elgin Park Drive, Unit D, Uxbridge T: 905-852-6733 E: vitu@powergate.ca “Healthy sight for life™”. Provide a full scope family optometric practice. No referrals necessary. All ages welcome. Continued from p. 7 Own Your Sparkle www.nicolescott.ca Nicole Scott T.: 416-427-5080 Nicole is a Holistic Nutritionist and lifestyle coach. She specializes in plant based solutions, wealth building options and DNA Testing. PARACHUTE VIRTUAL SERVICES www.parachutevirtualservices.com 81 Second Avenue, Uxbridge Rachel Leslie, Owner T: 647-261-9242 Virtual Assisting and Event Management. Supporting businesses and Freelancers so they have more time to focus on their business. RIVER STREET WRITING www.riverstreetwriting.com Hollay Ghadery T: 647-866-7784 E: riverstreetwriting@gmail.com Over a decade of professional writing, editing and creative consulting services for print, online and personal projects. RON NOBLE INSURANCE www.ronnobleinsurance.com 2 Elgin Park Drive, Unit E, Uxbridge 15930 Old Simcoe Rd, # 10, Port Perry T: 905-852-3309 (Ux) T: 905-985-3344 (PP) We offer a full range of property and casualty insurance including automobile, home, farm, commercial, watercraft, recreational vehicles, professional liability and travel insurance. ROOM FOR A CHILD www.roomforachild.ca 14 Oakside Drive, Uxbridge T: 647-993-1653 E: dawngillespie07@gmail.com Room for a Child is a registered non profit organization that creates beautiful bedrooms for children living in poverty. SCRAMBLES RESTAURANT www.foxbridgegolf.ca 350 Reach Street, Uxbridge T: 905-852-7323 Kitchen & Bar. Book your events. Daily lunch specials. seven8creative www.seven8creative.com 938 Yonge St., Barrie T: 905-806-0321 E: john@seven8creative.com Freelance graphic designer. UPRIGHT DOOR SERVICE INC. www.uprightdoorservice.com Alan Fortnum T: 905-852-1981 E: info@uprightdoorservice.com Fast, dependable service and repairs. Sales and installation of quality garage doors & operators. UXBRIDGE FAIR BOARD www.uxbridgefair.ca Bev Latva, President T: 905-852-7745 E: secretary@uxbridgefair.ca The Uxbridge Fall Fair is an annual celebration of community and agriculture held every year on the weekend after Labour Day. UXBRIDGE ON-LINE INC. www.uxbridge.com Annie Hardock, B.Math T: 905-852-6686 E: annie@uxbridge.com Owner and operator of www.uxbridge.com since 1996. Internet advertising. UXBRIDGE PILATES www.uxbridgepilates.com Laureen Dubeau T: 416-409-2533 E: train@uxbridgepilates.com Uxbridge Pilates is a fully equipped studio offering Pilates-based core training and workshops for fitness professionals in an intimate and inspiring setting. UXBRIDGE PUBLIC LIBRARY www.uxlib.com Corrinne Morrison T: 905-852-9747 E: corrinne.morrison@uxlib.com The Uxbridge Public Library provides a wide variety of programs, print and nonprint materials, games, computers, and genealogy information. VIVE! MEDIATION INC. www.vivehr.com 2 Campbell Drive, Suite 306C, Uxbridge Sally Morgan, President T: 905-868-0905 E: vivemediate@gmail.com Vive! Helps people navigate through conflict, get stuck and find solutions for growth. WESTFALEN ORTHOTIC SERVICES INC. www.westfalen.ca 24 Toronto Street, Unit 3, Uxbridge Amanda Field, Owner T: 905-999-4699 E: Amanda@westfalen.ca Certified Pedorthist providing assessments, in-house manufacturing, and fitting of custom foot orthoses. WHITE GLOVE VIRTUAL ASSISTANT www.whiteglovevirtualassistant.com 7 Confederation Drive, Uxbridge Andrea M. Scowcroft T: 416-819-3475 E: andrea@whiteglovevirtualassistant.com We help you focus on your business by taking over the tasks for which you don’t have time or expertise. WHOLESOME LIVING Health, Wellness, Vitality, Life www.wholesomeliving.ca Reesa Mustafa, Registered Holistic Nutritionist T: 647-773-7330 E: reesanutrition@gmail.com Nutritional consultation and meal planning to suit specific dietary needs. Sport Nutrition specialization. Eating for specific health conditions, supplementation. WRIGHT WEB PHOTO www.wrightwebphoto.com 11 Remion Crescent, Uxbridge Stephen Wright T: 905-852-9520 E: info@wrightwebphoto.com Web Design, SEO, Marketing, Wedding & Portrait Photography, Corporate Headshots & Store Photography. UNG Members!! Lisa Ritchie CPA Accounting Services new office space at 304 Toronto Street S, Suite 207 in Uxbridge!! Mill Run Golf Club for Celebrating 35 Years!! Boston Pizza for their Grand Re-opening on March 1st!! ZIBA’S SPA zibaspa.com 36 Ash Street, Uxbridge Dr. Ziba Parsi, Founder and Owner T: 905-852-2845 E: info@zibaspa.com Ziba’s Spa offers a variety of natural healing and beauty treatments to address body and mind imbalances and skin issues. UNG MEMBERS RECEIVE 10% OFF ADVERTISING When planning your advertising, consider... Uxbridge owned and operated. Hyper-local content which means we're better read. Better read means your ad gets seen Very competitive rates. Our paper quality and printing are superior, which means your ad looks great Canada Post delivery to all residences and businesses throughout the township. Your ad doesn’t end up in the ditch! Supporting businesses and freelancers with General Administration, Social Presence, Marketing & Event Management tasks. Giving you time back in your day so you can focus on your passion, your business! For all your window treatment needs. Your local decorating store specializing in custom window treatments and home décor. We carry quality blinds, shades and shutters, manufactured in Canada. Visit our fabric gallery to select the perfect material for your custom drapery treatments and upholstery needs. Let us help you sort through your wants and needs while keeping you within budget. Call us for a free in-home consultation. Each township has an individual action plan to implement goals and objectives of the Plan and is supported by regional staff, township staff, committees and community stakeholders. The northern municipalities of Durham Region share similar challenges to economic growth. These challenges are influenced by many factors from the global economy to government policy. Moving forward, an updated Plan and associated individual township action plans are required for the next five years to reflect the changing economic environment. involvement. This demonstrates a community focused approach to economic development; working together and taking responsibility for the future of our communities is the best way to ensure that north Durham continues to thrive. The Vibrant North Durham Plan update is being led by the Region of Durham’s Economic Development and Tourism Division (Agriculture and Rural Affairs) in partnerships with the townships of Scugog, Uxbridge and Brock. Consultation sessions will be held throughout north Durham starting in early April. For more information, please contact Stacey Jibb at Stacey.Jibb@durham or call 289-404-1765. “Strengthening Uxbridge ONE Person at a Time” Full Service 6,000 sq.ft. Friendly Fitness Facility • Large Cardio Mezzanine • Strength Machines • Free Weights • 55+ Weekly Fitness, Circuit, Yoga & Bootcamp Classes Something For All Ages & Levels • Personal Training • Spotlessly Clean & Modern • Bathrooms, Showers • Great Hours! • A Variety of Memberships Starting at $45/Month! Jennifer Fair: I checked out all the local gyms & as soon as I walked into NRG 4 Life, I felt instantly comfortable. The staff & trainers are kind, never judging + they knew my name right away! So far I'm down 50 pounds & feel great! YOUR WAY OF LIFE MATTERS TO US! giving as many referrals as she’s received, proof, once again, that’s it’s not always what you know, but who you know. EVENTS Durham Lifestyles Show Connecting people to local business – Saturday, May 4th, 2019 from 10:00am to 5:00pm at the Mill Run Golf Club, 269 Durham Regional Road 8, Uxbridge. For Info visit www.durham-lifestyles.com Tour of Homes - Uxbridge Home Tour The Trinity United Church Women present the 49th Tour of Homes which takes place on June 1, 2019 from Noon until 5:00pm. See fabulous homes on this self-guided tour. For more information visit www.trinityuxbridge.com or call 905-852-6213. 416-684-0053 • dcordi2015@outlook.com Allowing you to do what you're great at, without worrying about the paperwork! THINKING OF BUYING OR SELLING? CALL TODAY! Weekly program for ages 4 & Up. Join Anytime. CELEBRATING 35 YEARS! EAT, DRINK AND BE GOLFING WITH US IN 2019! Learn the game, the etiquette, live a longer, happier life. Are these qualities important to you? Then, look no further. Let's hear from experienced networking guru, Annie Hardock, about how the Uxbridge Networking Group continues to attract strong multiplicity of talents as members since she established the group over 20 years ago.